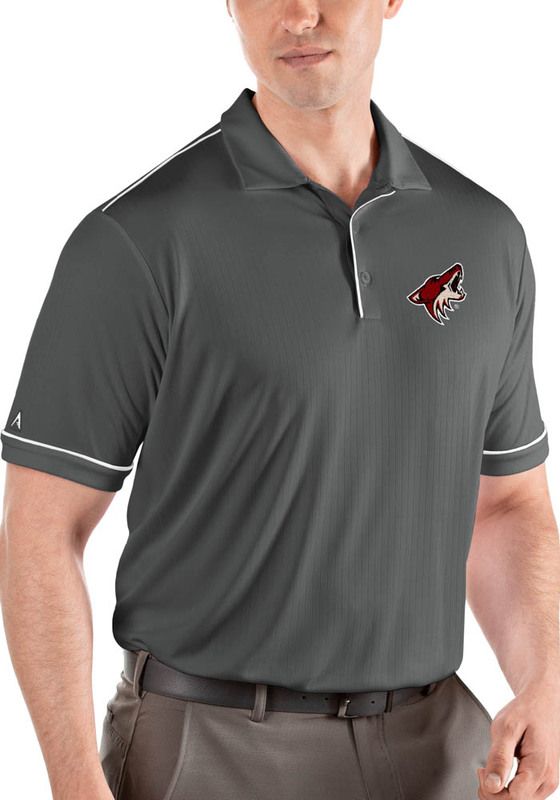 Showcase your Arizona Coyotes pride at the office or on the golf course in this Antigua Grey Salute Short Sleeve Polo! You'll look sharp in this Howler the Coyote Polo, which features a Arizona Coyotes logo on left chest. 100% polyester Desert Dry TM moisture wicking solid vertical stripe drop needle polo with self-fabric collar, 3-button placket, side slits, and contrast tipping at placket, shoulder forward, and cuff seam. Triangle Antigua patch at right cuff. This AZ Coyotes Grey Salute Short Sleeve Polo Shirt is the perfect update to your professional wardrobe.